To grasp the degrees of freedom in the provision of primary control power use (Source) presented by the four German TSOs, an accuracy of ±1 mHz is an advantage over the previously required ±10 mHz, since the difference between permissible measurement uncertainty and measurement uncertainty of the device, can be used for example for a charging management of battery storage. Therefore, the instruments used for the frequency measurement were developed from the initial prototypes for scientific analysis to a product. The meters are now available in a simple version and a version with time synchronization via GPS. The accuracy is better than ±1 mHz, the resolution is 0.1 mHz. → For more informatino see frequency meters. The ENTSO-E member countries should establish a plan until the end of 2015 to retrofit the dispersed generation to enhance the tolerance band in distributed energy systems such as wind and PV systems to 47.5 Hz to 51.5 Hz. The ENTSO-E has published a position paper in November 2014 (DISPERSED GENERATION IMPACT ON CONTINENTAL EUROPE REGION SECURITY). Herein is described that at the advent of the first dispersed generation with respect to the mains frequency only tight shut-off criteria were set to obtain as quickly as possible defined conditions when a fault in the network occurs. The following strong expansion of dispersed generation now leads to some problems, which can be solved through expanding the frequency band significantly - to 47.5 Hz to 51.5 Hz. 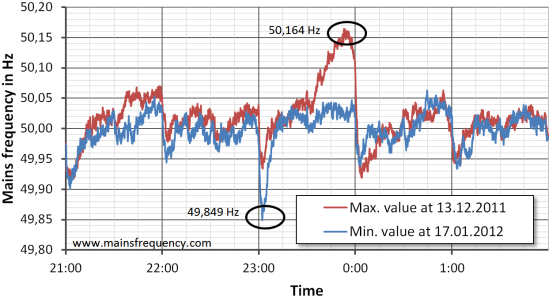 The following figure shows the frequency response (average of seconds) for several hours before and after. Both the highest and the lowest value occurred in the late night. To see this more clearly, the measured values (average of minutes) were put in a scatter plot. 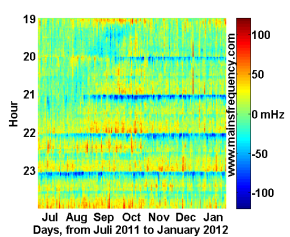 It is shown that frequencies below 49.90 Hz occur only at night. In the time between the change of hours reveals a band of frequency deviation of about ±60 mHz, which results from forecast errors and unexpected changes in the supply or the load. On hour change significantly higher deviations can be seen. Forecast errors are caused by unexpected consumer behavior, power outages and loss or reduced supply by conventional and renewable power plants. If the forecast errors in consumption and production would occur randomly, then the analysis of the frequency deviations from 50.0 Hz would show a steady noise. 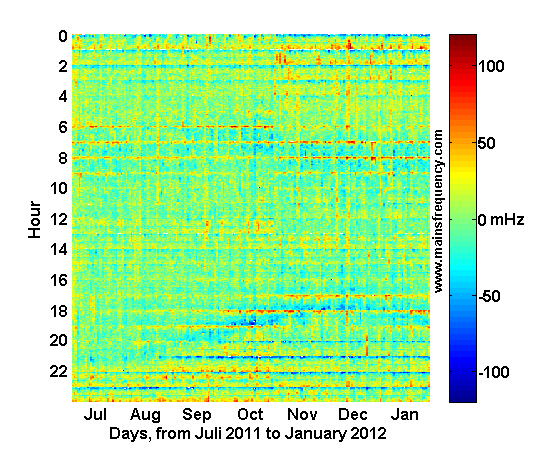 Instead, the Carpet plot shows systematic frequency variations on the hour change. The greater the change in load, the greater the deviation. 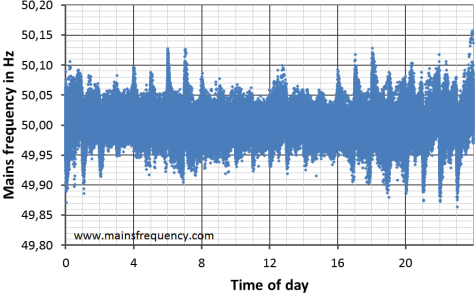 This effect is caused by the systematic error between the 15-minute schedule of the power consumption forecast and the purchased hour-blocks from the EEX. When the load increases (eg in the morning) then the purchased power generation does not increase continuously, it increases each hour. This activating of power results to over-supply, so the mains frequency increases for a short time, until the secondary control power decreases it. This can be observed vice versa in the load reduction of the late evening. Because of the inertia of the thermal power plants, they are allowed to drive the load changes as a ramp within 15 minutes. The frequency deviation shows that the ramps are driven much faster. The duration of the ramp can not be accurately determined because the onset of the secondary control power, apparently, the power is activated or withdrawn within about 4 minutes. The left image shows the frequency deviation in the early morning hours (5 am to 10 am), the right image shows the evening (19pm to midnight). 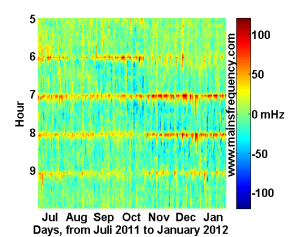 The images show the opposite view of the frequency deviations according to the morning load increase and load reduction of the late evening. This systematic frequency error within the hour change frequently allocates over 50 % of the primary control power, during this time is no longer available to offset other errors. The effect is substantially weakened only when the majority of the electricity traders balance their balancing group in the newly created market for 15-minute products. EEX SPOT startet trading 15-Minute Contracts on 14 December 2011 (press release). This should help to avoid the frequency-deviations generated by the hourly trading and make it easier to integrate the influx of renewable energy, which is seldom constant for an hour.